We love to have fragrant lilacs in our garden, so when they don't bloom it is very disappointing. This is a guide about what to do about a lilac not blooming. As far as a shrubs go, lilacs are a dream come true for the gardener. Once established, these landscaping beauties will throw out heavenly-scented, long-lasting blooms for years and years-and all with very little care and maintenance on our part. Why is it then, after weeks and weeks of anticipation and doing everything right, your lilacs always fail to bloom? Here are the eight most common reasons. The fact that lilacs prefer being located on a site with full sun is an understatement. To thrive and flower, lilacs need a MINIMUM of 6 hours of sunlight every day. If your lilac bush is not blooming, check to see if your site is too shady. A lilac will not bloom before its time, and most varieties of lilacs won't bloom until they reach at least 3 to 6 years of age. Years 1-3 are spent growing and developing. Only then, and only when they are good and ready, will they produce their first blooms. When they finally do bloom, the first few years can be less than spectacular. Don't worry, be patient. It's worth the wait. 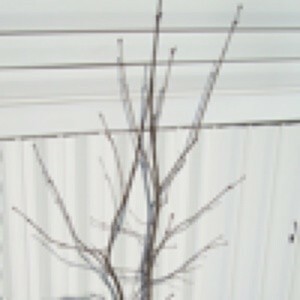 Hint: Most lilacs purchased in containers have passed their first birthday and started to develop a good root system. They will generally flower sooner than bare-root shrubs. Imagine stuffing yourself full of food and then trying to perform something that requires you to expend lots of energy (think Thanksgiving). This is how it is for lilacs getting too much nitrogen. The primary nutrients in fertilizers are nitrogen, phosphorus, and potassium (on the fertilizer package, they are listed in this order, N-P-K). Nitrogen promotes growth above ground. Phosphorus promotes growth below the ground (roots) and is most responsible for flowering. (Potassium helps with overall growth.) Using a fertilizer high in nitrogen will encourage your lilacs to produce an abundance of green leaves, while at the same time, prevent it from flowering. Fertilizing lilacs is not mandatory, and if your soil is nutrient-rich, your lilacs won't need feeding more than once per year in the early spring (if at all). When you fertilize, use a fertilizer with twice the ratio of phosphorus to nitrogen in order to promote flowering. Remember, grass craves nitrogen, so if you're fertilizing your lawn your lilacs may be getting over fed. If you've recently purchased a lilac for transplanting, it may still be adjusting to its new environment. Even if it was blooming when you bought it, you shouldn't expect it to bloom for the next year or two following transplanting. Lilacs need a fairly long period to settle in. You may need to wait as much as 3 years before it fully recovers. Lilacs don't like their feet constantly wet, but summer droughts can take a toll on the next year's flower buds. Keep your lilac on a regular watering schedule and adjust it for heavy rain or extended periods of drought. If you wait too long to prune (after midsummer) you're going to be cutting off next year's flower buds. Pruning should be done immediately after flowers die off, because next year's buds form shortly thereafter. 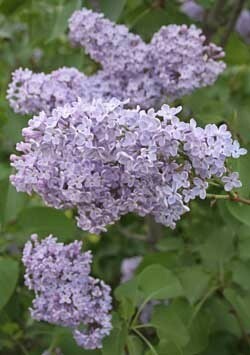 If your lilac bush has become overgrown, cut back only the oldest 1/3 of the shrub each year over a period of 3 years. Lilacs prefer a soil pH from 6 to 7 (a little on the alkaline side). If your soil is too acidic, or missing certain nutrients, your lilacs won't bloom. And testing your soil is the only way to know. Inexpensive test kits are available at more garden centers, or for the most accurate test, contact your county extension agency for labs in your area. If the results indicate your soil is too acidic, the International Lilac Society suggests spreading fireplace ash around the drip line of the bush for bigger and better blooms. If you've purchased you lilacs from a reputable local nursery, this probably isn't your problem. Still, large discount garden centers sometimes stock zone inappropriate plants and shrubs. Most common lilacs (Syringa vulgaris) need a cold winter to allow it to set buds. If you live in an area of mild winters, a Meyer lilac (Syringa meyeri) may be a better choice for your garden. If none of these reasons can be applied to your situation, consider giving your bush a light root pruning in early summer. Jam a sharp spade into the ground on two sides of the plant about 12 inches out from the trunk. And maybe next year will be the year! I have found lilacs tolerate slightly acidic and slightly alkaline soils quite well. And they do well on clay soils, which will tend to be alkaline. And while I agree with most of the statements made by the author, the best flowering lilacs I have observed are beside old, abandoned farm houses, where the shrubby tree is never pruned, or fertilized - just left alone. I have a lilac that has blossomed once in the 12 years we have been here. It grows well every year and gets about 6ft high, but hasn't bloomed for 10 years. Any reasons or suggestions? Lilacs bloom on young wood. You should prune it back. It may affect blooming for a couple of years, but it will bloom again. My elementary school had dozens and dozens of lilac plants and I loved them. Sadly, at my current home, which less than a mile away from where my school once stood, I can't host one bush to save my soul. While these are generally super low maintenance plants (they survived 40 plus years at an elementary school being tortured by kids), it is one plant where the dirt matters. They like nice loamy, rock free, and well drained soil and homes. My yard...clumpy, clay/slate/rock filled dirt with bizarre and in some cases downright nasty drainage issues. So my first recommendation is to make sure your dirt is lilac friendly. Mine failed because I didn't have the patience to till the soil in the beginning, remove the yuck (tiny tree roots and rocks, etc.) and mix in the right amount of compost. They didn't make it out of the first year. Friends who have them do work their soil every spring to keep it loamy and to watch out for water ponding (and remove it) as lilacs don't like to get their roots saturated. Learn from my mistakes...and with a little patience, if bad soil is your issue, you can get it up to speed and hopefully get the lilacs to bloom sweetly! My lilac bush is 3 years old and produced 1 lilac bloom. What do I need to do so it will produce more lilacs next spring? Call a nursery, they will answer your question. It's either still getting established or it needs a soil amendment. For the last two seasons my lilacs have budded out, but then the buds just turn brown and never open into flowers. They had bloomed fine, if sparsely, before. Call your county's extension office; the people there are master gardeners; familiar with your soil, and climate etc; and they can readily and easily tell you what to do! These folks are a fantastic resource! especially for us gardeners! good luck! I planted an old fashioned lilac 3 years ago and it is still only about 1/2 foot tall. It looks very healthy, but does not grow and no blooms. What can I do? Does it have good soil and full sun? I planted 2 lilac bushes from my cousin's suckers 4 years ago. The plants look healthy, but I haven't had a single bloom yet. Is there anything I can do? First of all, make sure your lilacs are getting a full day of sun. Don't plant in too much shade. Watch where the sun falls at different times of the day. Don't fertilize too near lilacs. Also, try adding bone meal to the soil. I bought 3 lilac bushes about 3 ft high 3 yrs ago. They bloomed beautifully, but there have been no flowers since, just green leaves. I did cut hoping to fix the problem. What do I do to get flowers again? You do not say what your USDA zone is, and that may matter. Lilacs will not bloom if it does not get cold enough each year in the winter for them, regardless if they were blooming when you purchased them. The buds on my lilac just begin to develop, then they turn black and cease to develop into blossoms. Most of the country has had an extremely long and harsh winter season this year. I had lilacs in Nevada before I came to Florida, and each spring we had another freeze just about the time the lilac buds were forming. Of course, the buds froze too, and turned black. All the leaves on any trees that had budded out also froze and turned black. If even your overnight temps dropped to near freezing, that will happen, and it also affects fruit trees the same way. You might have overfertilized your tree. It will not bloom if it has too much nitrogen. I would leave it alone and see how it does the next couple of years. We are in Pittsburgh, so similar climate. Our Rhododendron do well and have a lovely pink color. They come in other colors also. My mother has good luck with Azalea. They are also pink. Both bushes can grow as tall as you want or kept as small as you want. They are pretty hardy and both of ours have survived many years with benign neglect. Oh, and forsythia (although I have only seen yellow around here), they do really well in our climate. Neither of us have had luck with Hydrangea (although I love them) our soil is just not right for them. Too bad your lilac did not thrive. When I was in elementary school our building was surrounded by lilac bushes. When I was young I was terribly allergic to them (which thankfully I would grew). I love the smell and the deep colors. I really hate to see people remove an older plant without really trying to make it do what is desired. How old is this plant? Did your lilac tree/scrub ever bloom? Why did you cut it back? Has it been pruned in the years since it was cut back? You are in USDA zone 5-6 and most sites say lilacs grow best in zones 4-8/9 so that may be part of the problem. I would suggest you contact your local Agriculture/Extension Service and ask them about your lilac tree. If you answer the questions listed above (a picture would also help) they will help you find out why it is not blooming and if you still wish to remove it, they can help you with suitable plants to take its place. 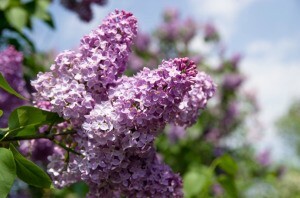 Some information from garden sites about how to help lilacs bloom. "Improper pruning - Lilacs do not need to be pruned, but if you prune it back hard in order to rejuvenate the bush, it will take several years to recover and may not bloom during that time. Even lighter pruning, simply to shape the bush, can affect how well a lilac will bloom. Pruning lilacs in late summer will cut away the wood that would have been the blooming wood for next year. Lilacs won't bloom if they're overfertilized. They can handle a handful of 10-10-10 in late winter, but no more. Fertilizer Your soil may be at fault too. Lilac bushes that won't bloom could be the result of too much nitrogen. Because of this, you should not fertilize your lilacs. They do not need much in the way of nutrients, and fertilizing can cause a lilac to take up too much nitrogen, which keeps the lilac bush from blooming. Age - Yet another reason for a lilac not blooming, or not blooming well, is that it is too old. Lilac bushes bloom best on younger wood and, if your lilac is mostly old wood, the number of blooms will be reduced. You will need to do a rejuvenation pruning on the tree, which will affect the blooming further for 2-3 years, but after that the lilac bush will return to full blooming." I hope you will check with your agriculture agent (or someone from your local Master Gardener Center) before you remove your lilac. Here are a couple of sites that have a lot of useful information about caring for lilacs. Lilac must be pruned every year right after the flowering and not in Autumn. Very often people think that their lilac doesn't need to be pruned as it keeps on flowering every year but it is in fact because they cut the branches to make beautiful bouquets and this way prune the lilac at the right time and the right way it should be pruned. That is : every year just after it flowered and by cutting behind two buds of the ends of the flowered branches, because it is the buds of the previous year that flower in the spring of the next year not the buds of the year. I trimmed my lilac tree by mistake in the fall of last year. I have buds on the tree now April 18, 2018, but they look like old buds and they are not opening up. My other lilac tree has opened buds now. I am afraid this tree is in shock, but do you think it will produce at least leaves for me this spring? It can take several years to recover. I got a lilac 2 years ago. It bloomed one bud last year, but I am getting nothing this year. It is very green and healthy though. Do I need to put acid on it to help it bud? Hi, I bought a Little Miss Kim lilac from home improvement store and it didn't bloom the next couple of years. It began to bloom and has since. I think you will be fine. I heard lilacs are sensitive and just thought that is why mine didn't bloom at first. Hope it will soon, best wishes. I have a lilac bush in front of my townhouse. It used to be covered in flowers. Five years ago my HOA chopped it to almost nothing while it was in bloom. Since then I am lucky to get one or two flower bunches. The bush is back to the height it was before they chopped it, but without the flowers. Any suggestions? If they chopped yours, they probably chopped others as well, and now yours may not have one to exchange pollen with. My husband dug up 4 starts from our neighbor's beautiful lilac bush. The neighbor's bush has never failed to bloom and is just full of them every year! So anyway, one start was a root with stem and blooming flowers, the other 3 were roots. They all died except for one root start. This was five long years ago and the silly thing still has not bloomed. Not even produced buds. I have never pruned it out of fear of hurting it. It gets about 7 hours of full sun per day. It has grown beautifully and is about 4 feet tall and about 4 feet in diameter with nice green leaves. Can anyone please help me? I am ready to dig the darn thing up and stomp it. 3 years ago I planted a lilac bush. For 2 summers I got some growth and leaves, but no flowers. It is still a small bush, but has once again started to grow with lots of leaves on it. Is there anything I can do to encourage some flowers this year? The flower buds are set in the fall, so if you don't see flower buds as it leafs out, it won't be blooming this year either (unless you have one of the very new reblooming types). My lilac bush is 2 years old. It buds, but never blooms. What fertilizer should I be using? It's 3 ft. tall and I have never pruned it. It gets partial sun. What should I do to fix the problem? How do I get my lilac to produce flowers? I have a lilac bush a friend gave me. I planted it 9 years ago and it has never bloomed. Please help. I don't know what to do. I have a lilac bush that has never bloomed. I have had it for 10 years, it gets green leaves and that is all. I have cut it back as I was told to do but still don't get any blooms.